As you all have heard I have been using DoTerra Essential Oils on Hailey and myself for 1 1/2 years. Hailey had her feeding tube placed in October of 2012 I was given my first bottle of Frankincense in February of 2013 and I became a Wellness Advocate in December of 2013. I am not given a choice to how Hailey's disease progresses or what effects it has on her physically and emotionally unless we want to add antidepressants to our regimens. At first I didn't think that these oils would do anything. I thought it was hokey...but I didn't have anything to lose. Why not give them a try? Oregano is a member of the mint family, and is often called one of nature’s strongest antiseptics. Jean Valnet described Oregano oil as one of the strongest known anti-inflammatory drugs in reversing pain and inflammation with nearly the power of morphine as a painkiller. It is also an excellent lymphatic stimulator. Use on fungus and athletes foot. Because of its strong antibacterial, antiseptic, and antiviral properties, it is often used for candidacies and fungal infections. Use Oregano for respiratory ailments such as colds, flu, sore throat, asthma, bronchitis. It can also relieve congestion, loosen phlegm, and quiet coughs. DōTerra Oregano Essential Oil comes of the family Lamiaceae (Labiatae), the oil is steam distilled from an herb grown in Turkey. I read the warnings of Oregano being a HOT oil and the precautions on how to use it. I won't lie, Oregano oil IS hot and tastes HORRID! If you just put it on your skin it WILL burn. I diluted it and I gargled it and I also swabbed my throat with a long q-tip. After 2 rounds I felt better, I could swallow, after 2 days I felt perfect! I could swallow with NO pain at all. I did this for 10 days. I knew that you shouldn't use some oils for long periods of time and I asked my upline what they thought. I wanted to make sure that this was GONE and finally it was! So now the next time I get any kind of sore throat I'm going to the Oregano before I go to the Dr. That's just my experience with it. I also use peppermint oil. I used to get daily headaches and I would take an 800mg Ibuprofen EVERY day. I knew that wasn't good with the side effects that come with prescription medications but the head aches were unbearable. I had talked to our NUCCA Dr. about it and after weekly adjustments and daily use of peppermint oil (I used a rollerball on the back of my neck) I have been able to stay away from the prescription and I'm happy about that! 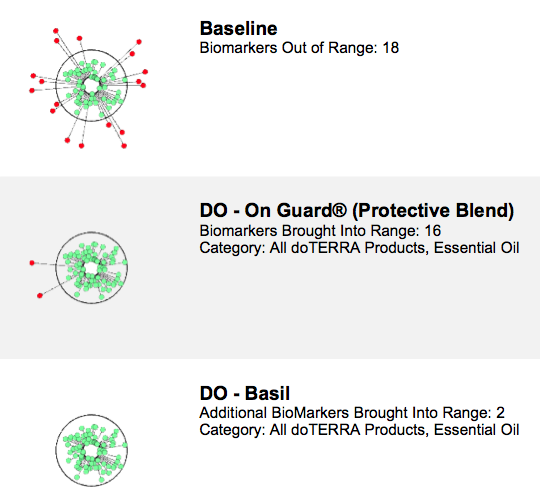 My upline (who has given me the prizes for the giveaways on our blog) recommended that I should get a Zyto Compass Scan and see if there is anything (essential oils and supplement wise) that my body needed. 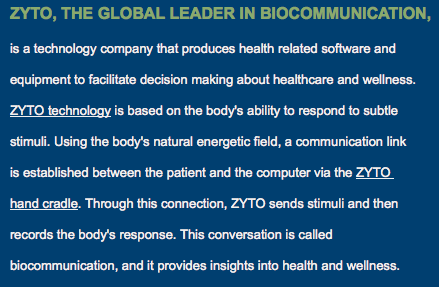 I don't know much about BioCommunications, but I looked it up HERE. It's a simple scan and takes less then 2 minutes. With all of Hailey's ailments I use a SLEW of oils on her and in turn I use them on myself as well since I'm massaging them on to her I also absorb them. I also diffuse the DoTerra oils in my house all day long. If I'm needing energy I can put in some Citrus Bliss or Elevation. If I feel sniffy from allergies I can put in the Breathe Blend. If I just need to calm down I can put in Lavender. All synthetic free, it's just a diffuser, oils and water. I again had my reservations thinking that this Zyto machine is going to tell us we were in need of all kinds of other oils that I don't have, but I agreed to take the scan out of curiosity. 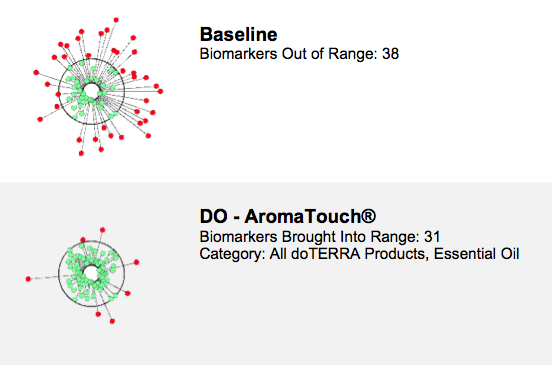 I was SO surprised when I get my results and it only said that my body lacked 2 oils and my baseline was only out of range by 18! I was even MORE surprised when someone else took the scan and they were given at least 7 different things that were recommended. I wanted to see what Hailey's scan would say and hers only recommended 1 OIL! It was Aroma Touch but with a range of 31 (pretty high). Aroma Touch oil made sense though. It helps to relax muscles (Hailey's spasms) calm tension, soothe irritated tissue, increase circulation and smooth and tone. When someone else went up and did their scan again lots of oils popped up! This person had at least 4 pages of oils and they're just a normal person with no disease. It was pretty interesting! I'm glad my upline shared this with me and told me that when ever I or any of my friends wanted to do a scan I'm welcome to it! After all, if it's all in my head then I'm happy I can fool myself into feeling better with DoTerra Essential Oils...LOL! 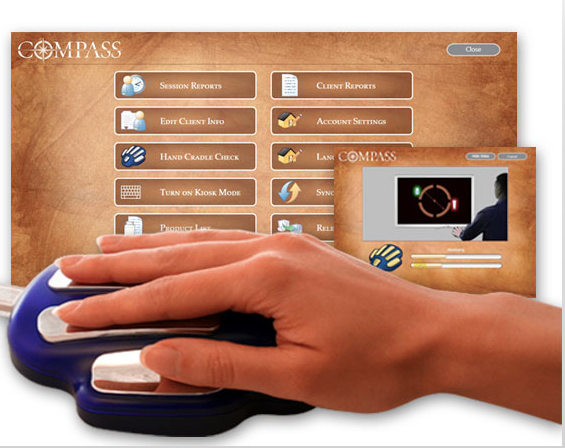 So if you get the opportunity to get a Zyto Compass Scan I say give it a whirl and see what it has to say and see if it applies to how you are feeling. If you have had a scan what did you think of what it told you in the results? Thank you to my DoTerra family for helping me with giveaways for Hailey. This month is a Diffuser! One of the best giveaways I've seen. All you have to do is place any order through this link to be entered to win: www.mydoterra.com/jessicagaston Winner announced July 1st. 100% of the commissions earned go to Hailey!